Last week I ruffled some feathers here by suggesting that the first week of postseason baseball had been boring. (To be fair to myself, I also ended the post with a section subheaded “Maybe this week will be better.”) I stand by what I said. The first round of the playoffs was full of mismatches and lopsided scores. Then there was no baseball for two days. But last night started to make up for it, and even though it’s a Saturday in October and for me that usually is about college football, I can’t wait for the two Championship Series games coming up later today. Verlander vs. Sale in primetime? Yes, please. But before we get there, let’s review a few of the storylines from last night’s entertaining mess of a baseball game between the Dodgers and Brewers. Brewers’ manager Craig Counsell is not the first to build a postseason series strategy around the extreme use of a deep bullpen. The Royals died (2014) and lived (2015) by it. The 2016 Cleveland Indians made it to Game 7 of the World Series with really one healthy starter and a not-so-secret weapon named Andrew Miller. It’s been argued in this space that really the pioneer of the approach was none other than Bruce Bochy, who used his pen cannily in Game 6 of the 2010 NLCS, Game 4 of the 2014 World Series, and, most memorably, Game 7 of the 2014 World Series. It’s not like Gio Gonzalez was especially getting lit up, either. Sure, he gave up a solo jack to Manny Machado, but–this just in–Machado is pretty good, and has been very good in this postseason. No, this was the plan for the game. But I’m pretty sure that when Counsell made the plan, having reliever Brandon Woodruff not only pick up the win in relief but hit a homer batting left-handed off Clayton Kershaw was not really how he drew it up. Sometimes your players can really make you look like a genius. I’m also pretty sure that having the back end of the bullpen nearly yak the game up in the last two innings wasn’t part of the plan, either. But all’s well that ends well. When the Brewers signed Lorenzo Cain and traded for Christian Yelich on the exact same day last winter, we all waited for the other shoe to drop, meaning the Crew flipping a young outfielder or two to bolster their starting rotation. Well, the shoe never dropped, and no, I don’t count the August pickup of a fading Gio as a shoe dropping. So now we’ll see how far this space-age planning takes the Brewers. I like the Brewers’ chances in the NLCS. They’ve now won 12 games in a row, and a small Milwaukee burger haven is about to give out a couple hundred thousand free hamburgers for the first time since 1987. The Dodgers made a late charge in the game, but before that, did you notice the body language on the field and in the dugout? They looked beaten. The Postseason Kershaw narrative has been a Thing for years. It’s not going away, and it now looks like it never will. Some of us really enjoy this (OK, it’s me) because (a) Kershaw’s a Dodger (b) he’s always owned the Giants and (c) he has a Backpfeifengesicht and ruins everything. But there’s a difference between last night’s postseason failure and the ones back in 2013 and 2014. Kershaw was 25 and 26 years old when those happened. In 2014, he won both the Cy Young (his third) and the NL MVP awards. Also, in 2014, Kershaw almost single-handedly pitched the Dodgers out of the postseason in the first round, as they lasted just four games (two lost by Kershaw, who had leads into the seventh inning of both games). So his epic postseason meltdowns were really shocking, considering he was a first-ballot Hall of Famer in the prime of his career. This Brian Kenny piece on MLBN points out that historically, stud Hall-of-Fame aces pitch like stud Hall-of-Fame aces in the postseason, so Kershaw’s lack of dominance is quite unusual. (His postseason record now stands at 8-8 with a 4.26 ERA. That’s not terrible, except when you start counting up how many of those losses were in elimination games  or in crucial tone-setting games like last night or Game 5 of last year’s World Series.) This is also not a small sample size, as most players’ postseason records can be: Kershaw has now pitched in eight different postseasons and amassed 133 innings. Whatever you make of Clayton Kershaw’s post-season, it is rare for a #HOF ace to struggle in the post-season. 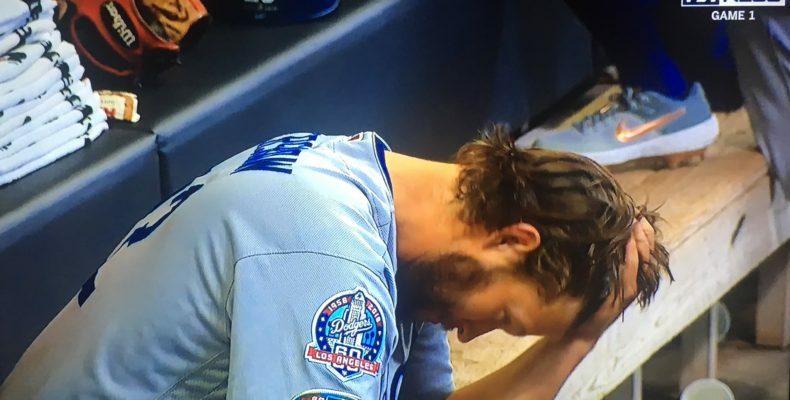 Clayton​ Kershaw’s​ past​ postseason failures are​ his​ past postseason failures. Friday night​ was​ not​ another​​ data point proving that one of baseball’s best pitchers cannot handle momentous spots. Increasingly, Kershaw’s slider and fastball have become the same pitch. They travel at almost the same velocity and move in a similar fashion. Thrown by different pitchers, both could be called cutters. There is little precedent for a pitcher relying on two so similar pitches for the vast majority of his output. How the rest of the postseason goes for Kershaw and the Dodgers is a story not yet written. (Moura goes on to say that “the Dodgers can win the World Series without an elite Kershaw,” but I’m not so sure about that–after all, the 2013-14 Dodgers couldn’t do it with an elite Kershaw.) Even more interesting is what Kershaw decides to do about his contract (he can opt out after this season) and, if he does opt out, what the market decides to do about him. Uhhhh, no thanks. In just the three-plus innings that Kershaw was in the game, Grandal had two passed balls, a very costly catcher’s interference call, and another error. Turns out he’s been at the top of the list for most passed balls for a couple years now. It’s worth remembering that the Padres were so dubious about Grandal’s defense that they had him play a fair amount of first base his last year or two with them–favoring, among others, Nick Hundley behind the plate. You could see it in Kershaw’s face: Where is A.J. Ellis when I really need him? Psych: He’s on the Padres! So, to summarize, we had Kershaw with the shortest postseason start of his career, a left-handed-hitting relief pitcher hitting a homer off a left-handed pitcher for the first time in postseason history, the home team on purpose pulling their starter after two innings, and the Dodgers catcher having a historically inept couple of innings. Are you not entertained? !